Comments: I had to give the video a 3 star , but the album sounds great! Hoping to hear more of them on CR! Comments: Wow! They are fantastic. Remind me a little of a band that broke up a few years ago called Greenwich Meantime who really got me into the Celtic Rock/Folk genre. Great sound with talented musicians. This is why I love Celtic Radio. Thanks for bringing them to my attention! Comments: From their humble beginnings as a cover band, to developing their unique blend of genres, SYR set out to gather inspiration from Celtic Folk, Irish drinking songs, Scottish folk numbers and Gaelic Ballads, blending these timeless genres with a contemporary twist coming in the form of their rock music background. On their recent self-titled album, the band alternates personal lyricism to storytelling inspired by Celtic Myths and old folk tales, going for a very personal and relatable approach. Comments: Tremendous debut CD! Fresh and powerful. Had the privilege of seeing them live at Tartan Day South in SC recently. Great live too. Well done lads and lassies! 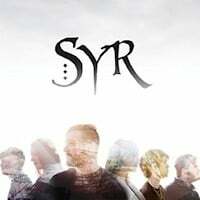 Want to write a review about SYR's Syr album? Post your comments in this box to be displayed in our community forums and in our album database! Please make sure you are logged in before proceeding. Please login to write your comments about Syr.